If you have a small logistics problem, we have the solution for you. [Leon] built a tiny little forklift with LED lighting, working forks, and remote control using a combination of 3D printing tech, some CNC work, and fine soldering skills. The electronics for this build are based around a few servos and a pair of geared DC motors and are driven via an Arduino Mega. 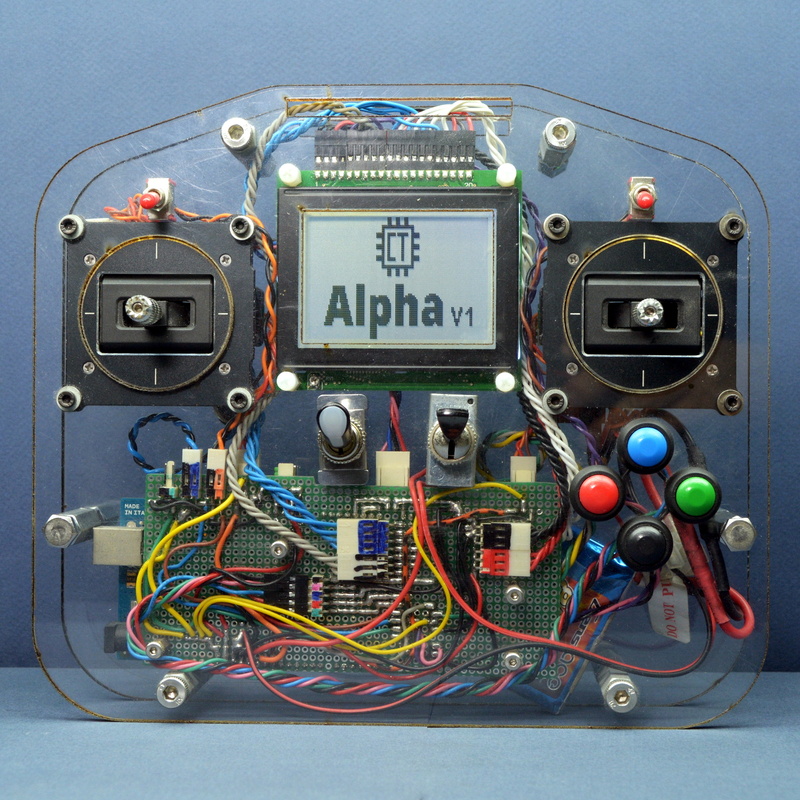 Connectivity and remote controllability are what you would expect from an Arduinified project. There’s an HC-05 Bluetooth module on the board and remote control is handled by a custom Android app. Of note in this project are the forks that actually work, almost like a real forklift. 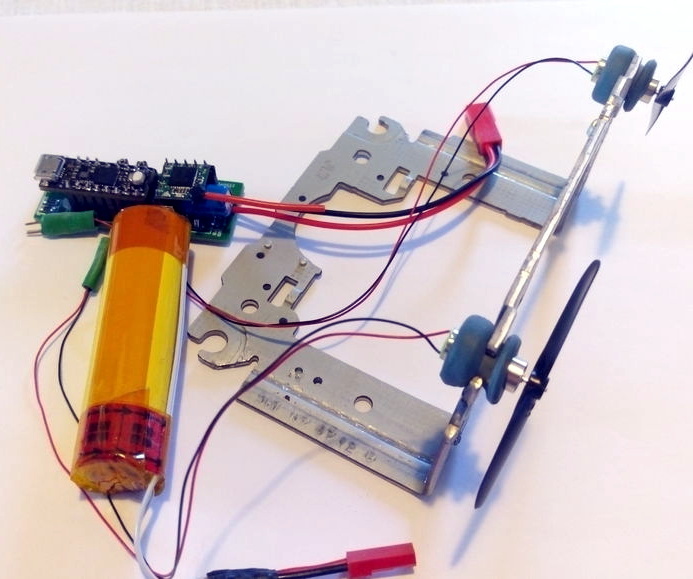 This allows the mini Arduino forklift to pick up mini pallets, drop them somewhere, and have mini DIY enthusiasts come up to build mini-furniture for mini-Etsy, which will be prominently featured in the mini foyer of a mini two-story walkup. No, it’s not mini-gentrification; this mini forklift is helping the mini local economy. You can check out the entire build video below, filmed in the usual maker demo method of speeding up the entire build process but somehow keeping the no-talking audio. We have a lot to thank [Jimmy DiResta] for, and it’s not just cinematography. All the files for this forklift are up on the Github should you want to build your own. Decades ago, [wilmracer]’s grandfather was piloting a B-17 over the Rhine, and as it goes, aviation runs in families. Now, more than 70 years later [wilmracer] is deep, deep into remote controlled aircraft, and he’s building an exacting scale model of the B-17G his grandfather flew on his last bombing mission over Europe. This is a scratch build, with the design taken directly from the plans and schematics of a B-17. [wilmracer] has already paid the money to go up in the preserved B-17 Aluminum Overcast to get a better idea of the layout, and now he’s deep into cutting foam and bending balsa sheets. The first part of the build was arguably the hardest, and the main landing gear was expertly constructed out of aluminum tube and linear servos. The horizontal stab follows traditional building techniques of foam and carefully sanded balsa sheets. The fuselage is impressive, with the formers built out of foam, and eventually covered in 1/16″ balsa and wrapped in fiberglass. If you’re going to do a large-scale model airplane, that also means you’ve got to do detailing. That means steam gauges rendered in 3D printed parts. [wilmracer] is modeling the cockpit and the machine guns in 1:9 scale. This is going to be an awesome build, and yes, there will eventually be plans. Of course, this isn’t the biggest small B-17 ever built. That record goes to the 1:3 scale Bally Bomber, a real, not remote controlled plane built over the course of two decades by [ Jack Bally]. This is a real plane with a 34 foot wingspan that weighs 1800 pounds. Yes, it flies, and it went to Oshkosh last summer. Remote control really is the way to go with something like this, though: you can appease the rivet counters, put more power on the props, and you don’t need to worry too much about pesky things like regulations and laws. We’re looking forward to see where this project goes, and to the sound of a great PLA overcast thundering over the treetops. While the era of the TiVo (and frankly, the idea of recording TV broadcasts) has largely come to a close, there are still dedicated users out there who aren’t quite ready to give up on the world’s best known digital video recorder. One such TiVo fanatic is [Gavan McGregor], who recently tried to put a TiVo Series 3 recorder into service, only to find the device was stuck in the family-friendly “KidZone” mode. Without the code to get it out of this mode, and with TiVo dropping support for this particular recorder years ago, he had to hack his way back into this beloved recorder on his own. The process was made easier by the simplistic nature of the passcode system, which only uses four digits and apparently doesn’t impose any kind of penalty for incorrect entries. With only 10,000 possible combinations for the code and nothing to stop him from trying each one of them in sequence, [Gavan] just needed a way to bang them out. 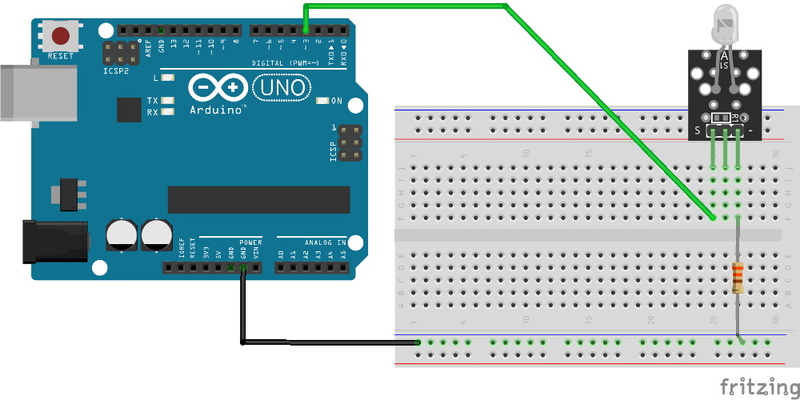 After doing some research on the TiVo remote control protocol, he came up with some code for the Arduino using the IRLib2 library that would brute force the KidZone passcode by sending the appropriate infrared codes for each digit. He fiddled around with the timing and the delay between sending each digit, and found that the most reliable speed would allow his device to run through all 10,000 combinations in around 12 hours. The key thing to remember here is that [Gavan] didn’t actually care what the passcode was, he just needed it to be entered correctly to get the TiVo out of the KidZone mode. So he selected the “Exit KidZone” option on the TiVo’s menu, placed his Arduino a few inches away from the DVR, and walked away. When he came back the next day, the TiVo was back into its normal mode. If you actually wanted to recover the code, the easiest way (ironically) would be to record the TV as the gadget works its way through all the possible digits. Back in 2004, there were so many TiVo hacks hitting the front page of Hackaday that we actually gave them a dedicated subdomain. But by the end of 2007, we were asking what hackers would do with the increasingly discarded Linux-powered devices. That people are still hacking on these gadgets over a decade later is truly a testament to how dedicated the TiVo fanbase really is. If we’ve learned anything, it’s that 3D printers are exceptionally well suited to printing little boats. According to the Internet, 3D printers are at their best when pumping out cute PLA boats in all the colors of the rainbow; perfect for collecting dust on a shelf somewhere. Ask not what your Benchy can do for you, ask what you can do your Benchy. But this 3D printed boat isn’t so cute and cuddly. In fact, it’s an absolute beast. Built by [Wayne Andrews], this nearly meter long 3D printed racing catamaran looks more Batman than Popeye. In the video after the break you can see a recent run of the boat on the lake, and we think you’ll agree it definitely has the performance to back up its fierce looks. Impressively, the hull isn’t printed out of some expensive high-tech filament. It’s the cheapest PLA [Wayne] could get his hands on, and glued together with nothing more exotic than Loctite Super Glue Gel. The secret is the internal “West System” fiberglass cloth and resin work, which is the same stuff used on real boat hulls. It took about 5 days of continuous printing to produce all the pieces needed to assemble the hull, which is a scaled up version of a design by [Thomas Simon]. 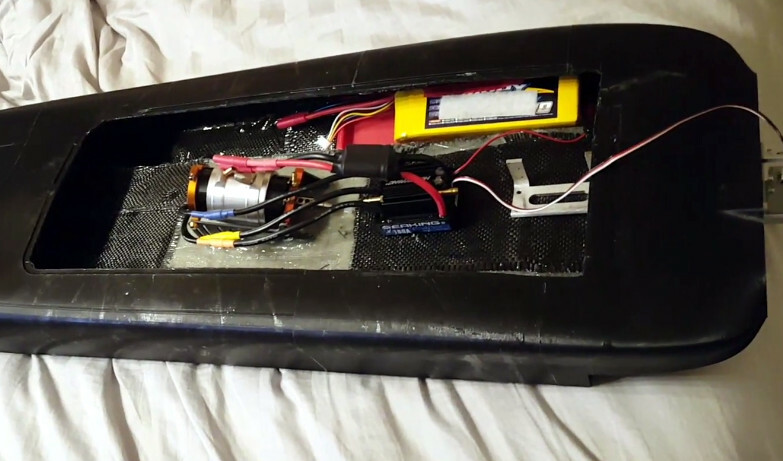 The internal layout is about what you’d expect in a fast RC boat. It’s running on a 1900 Kv motor powered by dual 6S batteries and a water cooled 180 A Seaking ESC which provides 5 BHP to the Octura x452 propeller. On the business end of his boat, [Wayne] used a commercial aluminum strut and rudder unit. Running gear printed out of something strong like nylon would be an interesting experiment, but perhaps a tall order for this particular motor. We recently covered a 3D printed jet boat that’s no slouch either, but if you’re looking for a more relaxed ride you could always 3D print a FPV lifeboat.